What a wonderful and very special quilt! My Grandmother(inlaw) passed away last Sunday quite unexpectedly (although she lived to be 93! ), she too was a fiend for sewing and all things creative, knitting for charity right until the end. She never went anywhere without her needles. The products of their creativity are such tactile reminders of how they touched our lives. Love this quilt, humility block and all! Such a personal quilt and it is so wonderful that you have managed to finish off this quilt though at times that must have been hard for you. Hopefully your mother has re-introduced you to a love of this craft that she held so dear. a really special quilt. well done for finishing it. What a nice story Lesly and beautiful quilt as well, you know I can relate. I posted one of my Mom's quilts that I finished at Amy's spring festival. Great photography too! Have fun at the festival. Your story is so touching and I am sorry that you had to go through that. Isn't it wonderful that your Mom left you such a wonderful part of herself? It does make us treasure every moment with our Moms. So glad that you have taken up quilting again! Oh, Lesly, what a touching story and lovely quilt! 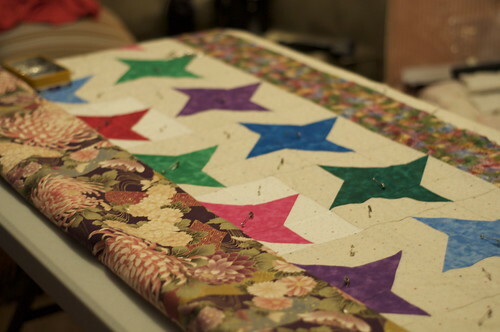 I am so happy that you started quilting again and managed to finish the quilt started by your mother. What a great legacy for your family. What a wonderful quilt and better story! It brought tears to my eyes! What a lovely story about honoring your Mother's memory. My Mom taught me all the crafty thing I love in my life now when I was just a kid. She passed away when I was 17. Your story made me realize that every time I sit down to quilt, it is a tribute to her as I create something for me or someone s=else. Thanks for posting! I shed a tear as I read your precious story about your mom and the quilt. I'm sure your mom would be thrilled to know you are sewing again! What a lovely quilt and story to go with it. 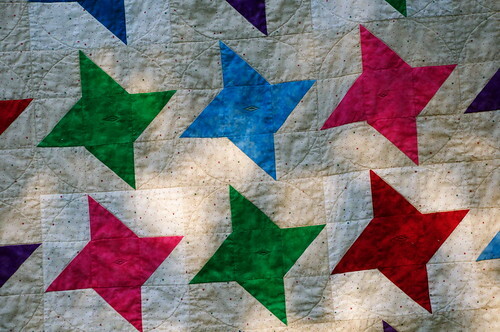 There is such a human need for tactile reminders of those we have lost -- quilts are comforting in so many ways. Thank you for sharing your beautiful story. It is really a beautiful quilt. Your mother sounded like a lovely lady. That is so neat that you were able to carry on where she left off - I can imagine how that could be very healing. And she's brought you back into quilting as well - so wonderful! What a lovely quilt. Thank you so much for sharing it and the story with us. I am glad you were able to use her quilt to help in your grieving process. A fabulous "memory" quilt. Thank you for sharing it with us. It's been an honor. Beautiful quilt, lovely story. What a fine tribute to your mother! What a touching story! I have one of my grandmother's quilt tops and hope to finish it soon. It makes me think of her whenever I pull it out. Thanks for sharing your story and quilt. Both are very special. What a beautiful story! I love that you finished it! I love this little festival, it is so fun to meet new quilters! What a great story and a beautiful quilt. I especially love the "humility block". Thanks for sharing. Your mother is smiling down and loves the quilt as much as you do. Me too! Thank you. What a wonderful legacy you have. What a gorgeous memory quilt to have -- and so special, having been worked on by both you and your mother. the quilt is so pretty. hugs. i'm also in ontario. Thank you for entering it. What a wonderful quilt you were able to share with your mother. What a touching story. Thanks for sharing it with us. I love the quilt. It is beautiful. That quilt will always make you think of her. That's such a great momento. I have tears in my eyes. What a beautiful treasure that you and your mom have created. Congratulations, on finishing it, and I hope that you continue to quilt. great story. Love the humility blocks... what a special quilt to treasure. snnuggle up and feel the love! That's a wonderful story! The quilt is very beautiful! I was so touched to read the story behind this quilt. What a perfect way to honor your mother's memory. Thanks for sharing it with us. What a beautiful story, and a beautiful quilt. What a touching story. It is so wonderful to have had the gift of being able to finish the quilt that your Mama started. Lovely! What a beautiful way to honour your mother's memory! This is a truely special quilt. Quilts have true healing powers - I made my grandmother a quilt that was the first one I created part of the design. She passed away about a year and a half after I gave it to her. My mother gave it back to me- for a long time I had difficulty seeing it without feeling sad. Now, I look at it and remember her with joy and thanksgiving. I loved your story and you should be so proud that you completed your mother's quilt. 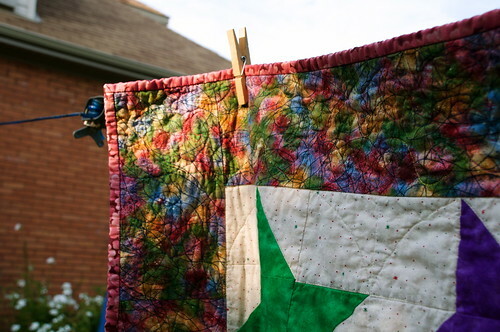 What a lovely story behind your quilt! Thanks so much for sharing. Your post brought tears to my eyes, as only another quilter understands how special a quilt can be to someone. I fall in love with every quilt I do. Does that sounds silly? Your mother/daughter joint effort quilt turned out wonderfully. I am also finishing a quilt for someone, but this one belonged to my grandmother. She has been dead for almost 30 years and probably made the quilt top 20 or more years before she died. It is made from scraps and I think feed sacks. It was intended to be a basic quilt to keep you warm, and is not a designer quilt by any means. I am hand quilting it and am sure it will be a great family keepsake. I posted a picture of the top earlier this week. I also love the name you gave your quilt!!! I am trying to come up with a special name for my grandma's quilt too. What a special way to honor your Mother's memory. What a tribute for your Mother's Yartzeit. May the Lord comfort you. I love this quilt. Lesly, what a beautiful quilt this is. And your sharing in making it with your mother really brought tears to my eyes. I lost my own mother when I was in my 20's, so I know how hard it is. It's something a lot of people do not understand because they have their parents til they are old. Thanks so much for sharing your sweet story. I love your quilt. 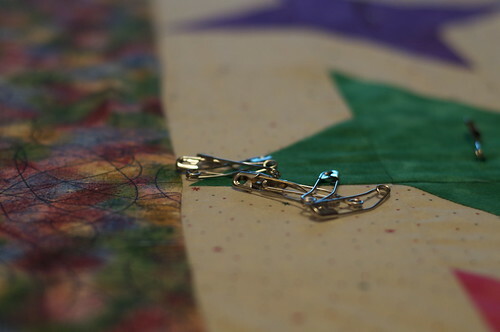 Thanks for sharing and for participating in the Blogger's Fall Quilt Festival. that is one special quilt - it is so neat that you were able to finish what your mother started - I'm sure she would be very proud that you finished the quilt for her. What a heartwarming, touching story. Your quilt is just awesome. A lovely story to go with a lovely quilt. Thankyou. 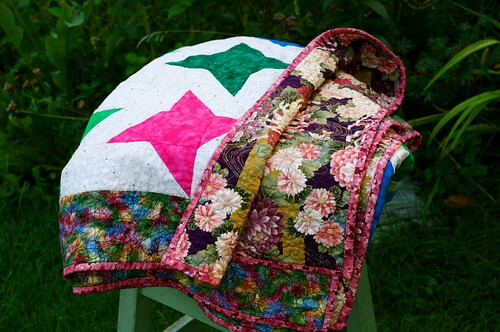 Oh, that story makes this beautiful quilt even more special, thanks so much for explaining it. Your mom would be very pleased to know that you thought so highly of her and are carrying on her traditions in your own special way. A wonderful and special quilt! Thank you for sharing it with us! 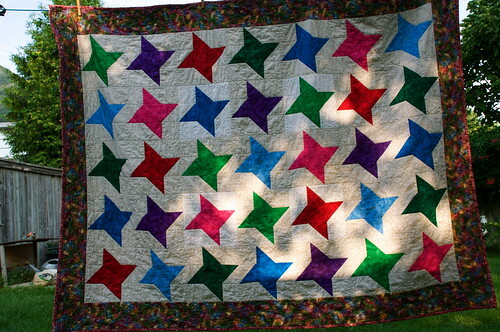 I love that the design is friendship stars and that your Mom chose all those bright colors...its the love and yes, friendship, between you and her that is memorialized in this quilt! What a beautiful quilt and such a touching story. So sorry to hear of your mom's passing. It must have been difficult but also healing to finish your mom's quilt on the anniversary of her passing. You did an amazing job as did your mom. Thank you for sharing. What a way to honor your mother. I hope you will continue with needlecraft like her. By the way, this is one of those I want to do too and I just LOVE the backing. Beautiful work...what a lovely tribute to your mother and a wonderful way to honor her memory. Such a lovely story and quilt for a sad circumstance. Lesly, what a lovely story about a lovely quilt! My mother passed away in 1980. After I started quilting myself my dad told me she had started making a quilt using English paper patches that you sew round. A family friend took it over and tried to finish it and after a while passed it to a church group who used it as a fundraiser for charity. After my dad passed away in 2005 we finally found the photo of the quilt. I can totally understand why it took so many people to finish it! Great quilt, wonderful way to remember your mom! I have a needlepoint that my Mom didn't finish before she passed on and after reading your story, that bag is now sitting beside me and perhaps it is now time to work on it. Lovely story and a beautiful quilt. Thanks for sharing. Beautiful story. I love quilts that have so much meaning behind them. Thank you for sharing this quilt! The quilt is beautiful, and the story that goes with it even more so. Thank you for sharing! 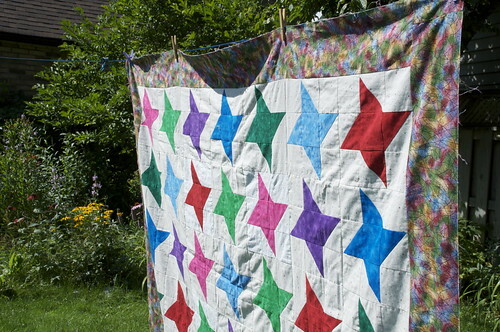 Quilts are never just cloth, are they...tears and stars and transforming joys. thank you much for your heart sharing. My goodness, I am overwhelmed by the compassionate and sympathetic comments that you all have left for me. I am trying to work my way through them to reply to each of you. I hope you will come back and visit me again! And if you still have your mother, phone her and tell her you love her. Right now! What a touching story and healing too. Beautifully named. I'm sure your Mom is look over your shoulder when you have her quilt. What a beautiful story for a beautiful quilt! I'm sure your mom is tremendously proud of you for picking up where she left off. What an incredibly special quilt. Thanks for sharing it and your story. Very touching! I'm glad you found peace and a return to creativity in the form of quilting. What a beautiful story, thank you for sharing it. How special that you could finish this for your Mom. I'm sure it was very hard but it turned out beautiful! An amazing story of love and respect. Your mother lives in your talents. I can't say anything that hasn't already been said about your lovely quilt and its connection to your mother. Thank you for sharing your heartfelt story. I love those bright stars, Lesly. They have so much impact. What a lovely quilt and touching story. Thanks for sharing your story. I'm sure your mother was a very special lady. My condolences and how blessed you are to have such wonderful memories and this beautiful quilt. The binding is especially lovely. What a beautiful quilt and a beautiful story that goes with it! Hi! your story behind this quilt is very touching! It makes all of us look again with new perspective. Hug up in it every day! We miss our Mom so much, it's nice to have the memories. wow...what a great story~I am so sorry about your mom~she left you quite a gift in so mant ways~thank you so much for sharing. What a special quilt, thanks for sharing its story! It is a beautiful quilt and a very touching story.